This is not a sweet little review where I say “I love the Muppets! Everything old is new again! Muppets can do no wrong!” I’ve read a lot of nostalgic reviews like that since early reviews started coming out, but I feel that a lot of those reviews slightly missed the mark. The movie was good, but it could have been better. I do love the Muppets. I was born after The Muppet Show finished airing, but I grew up watching the movies, enjoyed the reruns of the show when they re-aired it on the Disney channel, and watched the Muppet Babies show. My grandmother taped A Muppet Family Christmas when it originally aired on TV, and I watched it at her house even if it wasn’t appropriate for the time of year. So of course I was ecstatic to hear that a new Muppet movie was being made, and made by a well-known Muppet fan. I was also kind of nervous, though. There have been many retreads of my childhood loves over the years, some better than others. Well, I saw The Muppets last night and I had mixed feelings about it. Understand that I’m probably more critical than most and it wasn’t BAD… it just could have been better. The problems I identified with it are more problems in terms of consistency with the older Muppet films. Henson was very specific about the choices he made in those orginial films, and I don’t know that he’d be happy to see some of those departures from the Muppet trends he set. It was fine, but belongs more with Muppets from Space than with the original movies. There are going to be spoilers in this post. If you didn’t see the movie yesterday you probably aren’t a big enough Muppet fan to be devastated by me spoiling it for you. If you don’t want me to spoil stuff for you, don’t read the rest of this post. I loved the references to the old movies. They take a road trip… to France. Characters actually reference “Together Again” and even sing a couple of bars. I got so excited and really wanted them to sing the whole thing. But they didn’t. Gary and Walter ride a bicycle together. 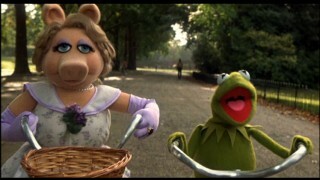 Bikes are big in Muppet movies. A photo from “Somebody’s Getting Married” is integral to the plot. There’s also a SUPER-adult song that Amy Adams and Miss Piggy sing (“Me Party”) that left the little boy in front of us asking his dad a lot of questions. Which is awesome. 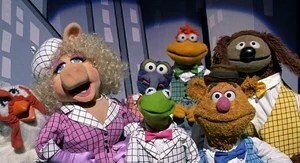 The Muppets should be for adults as well as kids. In general, the songs were good. The opening number was very Muppety (“Life’s a Happy Song”) and Kermit has a fantastic song (“Pictures in My Head”). Those were probably my favorites. Awesome. 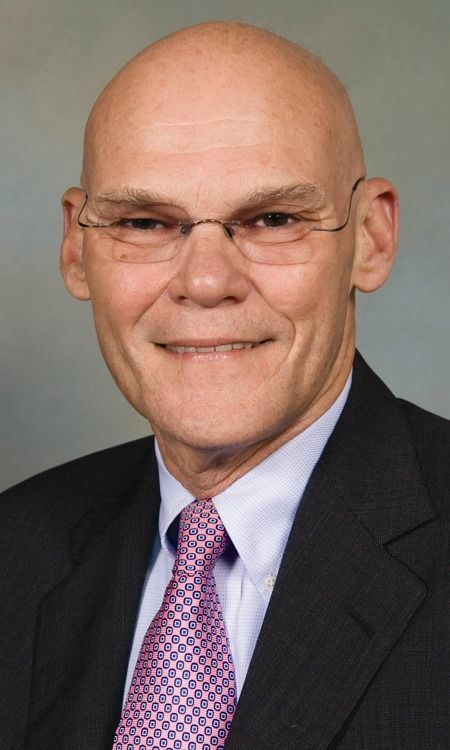 Carville is a giant Muppet. 1. My biggest problem with the movie was that there was far too much focus on the human characters. In the Muppet canon (I’m referring to The Muppet Movie, Take Manhattan, and Caper here), humans exist solely to further the plot. In the new movie, Gary and Mary are way, WAY too central to the plot. We don’t care if he proposes. Less you, more Muppets. Humans should be secondary characters whose lives are made better by having Muppets in them, not just Muppety humans who waste screen time with their human problems. There were secondary Muppets who could have gotten more screen time if they’d spent less on the humans. 2. Subtitles for a Muppet movie are nonsense. There are two unforgivable uses of subtitles in this movie. 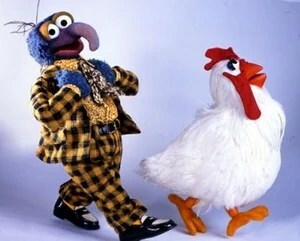 Gonzo understands Camilla, but we don’t. That’s funny. But when you subtitle her, it’s not funny anymore. Chris Cooper does a short rap song, which he performs with excellent and understandable diction, yet they felt the need to subtitle it. This actually made less sense than the Camilla subtitles. Why subtitle something the audience can clearly understand? 3. The movie was just too aware of itself. Muppet movies are supposed to be self aware, but it was just too much. 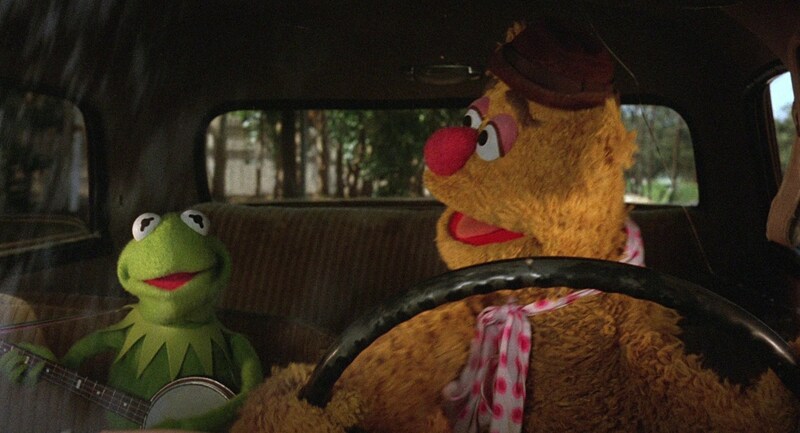 There are tropes in Muppet movies that are hilarious (“traveling by map”), but pointing them out and questioning all of them ruins them. You have to really see it (preceded by all the other Muppet movies) to really understand what I’m talking about. I’m all for a little postmodern self-reference, but they just went too far with it in comparison to the self-reference that’s par for the course in the original Muppet movies. This chick, whose name (Selena Gomez) I had to watch for in the credits to look up and find out how/why she is famous, shows up for a cameo and says that she only showed up because her agent told her to. Which probably describes why she was in the movie. Then Rico Rodriguez asked Kermit if he was a Ninja Turtle. By this point, it almost felt like they were trying to convince the audience that they weren’t relevant. Too much focus on the negative, like a slightly chubby girl who keeps commenting on how much weight she needs to lose in a desperate attempt to get someone to say “No, you look GREAT.” You ARE relevant, Muppets. Believe in yourselves. Did I like it? Of course. It was a Muppet movie. But I’d take any of the original Muppet movies (or Muppet Christmas Carol) over this one. Times change. I suppose a lot of the things I had problems with are part of trying to catch up with the times. The little boy in front of us seemed to love it. 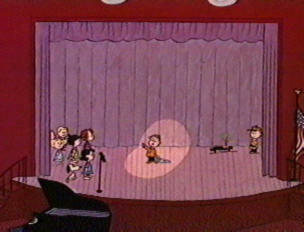 The (likely stoned, based on behavior) college students in the audience seemed to think it was the greatest thing ever. Maybe I’m just becoming one of those “They don’t make ’em like they used to” sort of old people. I hope today’s kids in general like it as much as the kids in our audience did. I hope they love it. I hope they love it like I love The Great Muppet Caper. And I hope that when they’re nearing 30 they go see a Muppet movie and pick it apart because it wasn’t exactly like the ones from their childhood. Because every kid should grow up with a love for the Muppets. A fiercely loyal love like I have. I know, I know. I shouldn’t have done it. But my husband had to work today, and he wasn’t here to stop me. What would it hurt if I just put out a few Christmas decorations? “A few” turned into red and green napkins, placemats with holly on them, Christmas doormats and kitchen floor mat, Christmas hand towels, and our wreath on the front door. And I may or may not have broken out the Christmas CDs and a sugar cookie scented candle. And I may or may not have had a small glass of egg nog while doing all of this. So, pretty much the only decorations still in the closet are the tree/ornaments, stockings, and the nativity. Because I don’t think Patrick will be able to deal with all that Christmas coming out on November 13. I will, however, totally try to get those out of the closet prior to November 23, which is my designated “Elizabeth is now allowed to put out decorations” day for 2011. Usually I put out all the decorations on Thanksgiving (or the day prior if I’m going to have company on Thanksgiving). My parents trained me to believe that no Christmas music could be listened to, no Christmas movies could be watched, and no Christmas decorations could be put out until Santa came down the road in the Macy’s Thanksgiving Day Parade. My dad is probably one of the biggest Christmas lovers in the world, but he is very strict about when decorations can come out. Advent doesn’t start until after Thanksgiving in my parents’ house. I just can’t help anticipating Christmas as soon as Halloween is over. I absolutely love the whole holiday season, from watching every single holiday movie and TV special to listening to music to buying gifts. I dive headfirst into the secular trappings of Christmas, but I think it’s totally acceptable to enjoy all of that as long as I remember what it’s actually all about. Some people hate it when stores play Christmas music before Thanksgiving, but I will take every moment of Christmas that I can get. I can be thankful at Thanksgiving while still anticipating Christmas! Just don’t tell my dad. And if Patrick doesn’t comment on today’s early decorating, I’m totally putting up the tree next Sunday. Serves him right for leaving me alone in the house all day. I really don’t know how many times I wrote “Friends forever” in yearbooks between middle school and high school. Way more times than actually ended up being true. “Friends forever” is a much harder thing to accomplish than it appears at age 12 (or even at age 18). As I get older I am more and more proud of the friendships that have managed to withstand moves, years, marriages, children, and whatever other changes life throws our way. I want to throw the spotlight on one such friendship: my friend Jen and I have known each other since middle school, but really became close friends as we transitioned into high school (8th/9th/10th grades). She was a year ahead of me in school and always gave me great advice on everything from theatre auditions to how to survive Mr. Taillon’s geometry class. Here we are at prom in 2000 (her senior year, my junior year). I had moved away to Georgia, but it meant so much that my friends didn’t want to have this special night without me! Here we are at my wedding in 2009. Jen was one of my few New England friends who could make the trip all the way down to Florida for the festivities, and I was so thrilled to have her there! So, I think I’ve established that I’ve known Jen for a long time and she’s always been there for me. She has known me for every single romantic relationship I’ve ever had and every degree I’ve ever gotten, and there are very few friends who I’ve kept in contact with through all of that. But here’s the real reason why I’m spotlighting our friendship today: Jen is running the Boston Volvo 5k Road Race for MS Research on Thanksgiving in honor of me (and also her aunt and cousins!). I’d like to ask that you consider donating – your money goes to MS research, so not only are you supporting my friend, but you are also supporting me (and every other person who’s waiting for a cure!). 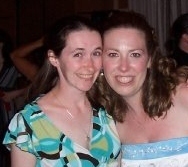 Jen has been there for me for so many years… please help me be there for her by donating to a great cause! Yesterday was my first competitive running experience in… well, almost half my life. In high school, I ran track until I got mono (January of my sophomore year of high school) and the doctor encouraged me to lay off the running until I was fully recovered. I ran some my junior and senior years, but not competitively and pretty much only when my mom made me. In college, I ran sporadically, but only when I felt like it and certainly never competitively. I started running consistently again in 2007, but I didn’t really get the urge to register for any sort of race until this summer, after I was diagnosed and realized that I won’t have the ability to race forever. Yesterday I ran the Race for Smiles 5k. Prior to the race, I set some goals for my running, made an awesome race playlist, and got a great night’s sleep (8 hours!). Then I woke up to discover that it was 40 DEGREES outside. I know my friends from New England will laugh at me, but in weather that cold, I usually opt for the treadmill. I’ve been doing some outdoor running lately, but it hasn’t been that cold out, so I had to adjust my expectations. I went from a goal of 30:00 to a goal of just finishing the thing without freezing. I’d been planning to wear my favorite running clothes on Saturday (running crops and a short-sleeved shirt), but with the temperature where it was, I needed to throw something over it to keep warm… so I just tossed on a hoodie and hoped I’d be warm enough. I showed up to the race about 15 minutes early and found that there were a lot of twiggy little women, buff men, and super athletic children in their expensive running gear ready to take on the course. I’m very proud of the weight I’ve lost, so please don’t think I’m calling myself fat, but at a size 10 I was easily one of the largest women there. Definitely the largest woman in my age group. From that point, I adjusted my expectations to NOT finishing last. They organized us onto the road and explained the course. It involved multiple U-turns, two big hills, and, just prior to the first mile marker, crossing a MAJOR road. They said everything would be clearly marked (and, for the most part, it was). When the race started, I did exactly what I’d been telling myself not to do, which is that I got caught up with the “fast” group and started out way too fast. It didn’t really hit me until I got to the intersection at the major road, where the police were NOT doing a good job stopping traffic for us. We had to jog in place at the intersection for over a minute before they finally stopped traffic and let us cross! Waiting at that intersection made me realize how exhausted I was (which was terrible, since we hadn’t even reached the first mile marker yet). After we crossed the road, I let myself split back from the fastest group, since I knew there was no way I could keep pace with them if I wanted to actually finish the race. I fell into a small group of other “in-between” runners who had slowed together, and we pretty much did the rest of the race in that group. When they handed me my timecard at the finish line, I was pretty surprised that I was 42nd overall (it seemed like there were a lot more people in front of me once the groups split). I don’t know how many people were racing, but the highest bib number I saw anyone wearing was 133, so there were at least that many people (which puts me in the top third). I decided to wait around for the awards because my super-fast 11 year old next door neighbor had placed 10th overall and I wanted to support him. Imagine my surprise when I was announced as the winner of the Female Age 25-29 age group! It was definitely not what I expected when I registered for the race, and it absolutely made me feel good about myself. My PR in high school was much faster than what I accomplished yesterday, and I know that if I’d been more prepared for the weather or hadn’t burned myself out on that first hill/mile, I might have finished faster, but I’m still pleased with myself and excited for what I can do on the next race. I watch so much TV, y’all. It’s not even funny. My friend Emily posted recently about her favorite TV shows, so I thought I’d share what I’m watching now, from the very good to the very bad. I watch almost nothing live. We almost always have a full DVR! I’m aware that I watch too much TV, but I’m not afraid to admit the shameful fact. Not as funny as the first couple seasons, but still enjoyable. I seriously would watch this show for HOURS. Shut up. I know it’s terrible. I just started watching this a couple weeks ago through On Demand. I’d heard one of the contestants has to do modified workouts because of leg problems. While I’ve not yet had such severe MS symptoms that I have to modify workouts, that is a distinct possibility in the future, so it’s neat to see her still getting active despite her limitations. We actually got into this show during the summer because they were airing reruns. 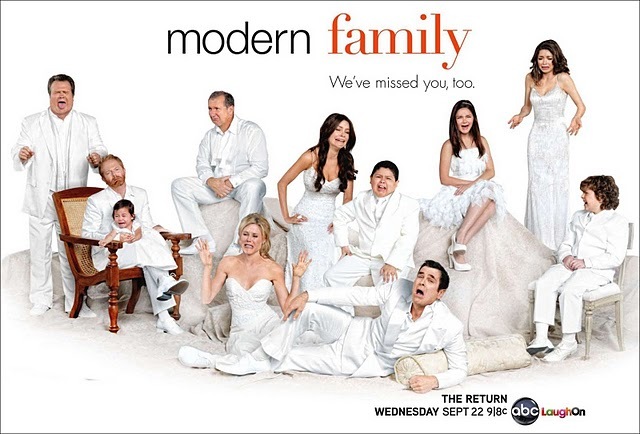 I wish more stations would air reruns during the off-season… it gives us a chance to give new shows – well, a chance. This is my SHOW. I’ve actually seen every episode of every season. I absolutely love this show. T is a total inspiration. This is absolutely the funniest show on TV. We started watching this show four or five years ago. I’ve never been a big fan of procedurals, but I like that this one actually keeps a through-line. This new show isn’t nearly as scary as I hoped it’d be, but it’s alright. Getting better as it goes. This show isn’t very consistent, but we keep watching it anyway. Episodes like last year’s Halloween classic give us hope each week that maybe the next one will be great. If you watched the start of season 1 and gave up on this one, I urge you to go back and try again. It really has grown into itself. I think Robert California (James Spader) is hilarious. Of course I miss Michael Scott, but this show has done a lot of things over the years that I thought would ruin it, but somehow they all made it better. Friday is the day when we catch up on all this DVRed nonsense. Oh, and in addition to all of this, we watch College Football all day on Saturdays and NFL all day on Sundays. I know this is kind of like an alcoholic asking about drink specials, but are there any shows I am not watching that I ought to be? I haven’t posted in a while… my priorities lately have not included blogging. Luckily I’m still getting plenty of hits from people who search 30 Day Shred, Annette Funicello, and “Gremlin Anniversary Wishes.” WHAT ARE GREMLIN ANNIVERSARY WISHES? Anyway, I read an “open letter” yesterday that left me appropriately outraged. In case you don’t want to read the letter, here’s the synopsis: The author is pissed at her niece for being a “picky eater.” She believes her niece is missing out on the wonders of the world (including discovering that one type of tomato is apparently superior to another) and essentially pins the whole “problem” on her sister’s parenting skills/lack of ability to travel the world. 1. I am not a parent. 2. I am not an aunt. 3. I have a really big problem with people who confuse the two titles. I’m a lifelong picky eater, so I have to take issue with this “letter” (and not just because I believe the blogger wrote it more to embarrass her sister than to impact her niece). I definitely took a long time to come around to some things, and sometimes my parents were really annoyed with my eating habits, for certain. My father once told me I couldn’t order salad at a restaurant anymore until I learned to use dressing. My friends teased me for ordering plain steamed rice at Chin’s (the local Chinese restaurant where seemingly everyone had birthday dinners). I actually CRIED when my parents took me to a Mexican restaurant… when I was 15. Growing up, I called myself a purist and used as few condiments (seasonings, sauces, AND spices included) as possible. I was totally happy with it, and while my parents did make me TRY new things, they also knew that they could only change so much about my eating habits. They taught me to be polite and eat what I was served, even if I didn’t really like it, but they also didn’t try to force me to actually like the stuff. Even now, I’m still pretty picky, but I’ve grown to like some things I thought I would NEVER like (and even some things my parents don’t like!). Did anyone force me into liking hummus or kimchi? No. I just kept being polite and eating what was presented to me… and, lo and behold, I began to like some new dishes. My husband still calls me “the lieutenant in the war against flavor” because I think peppers are gross and grits are terrible, but I’m working on it. Anyway, back to the article. One thing we picky eaters are is stubborn, and the best way to get us to hate (or refuse to try) a food is to try to shame us out of our pickiness. We are happy the way we are. The young niece of the author? Totally happy being picky, I’m sure. I don’t know her, but I don’t think she’s just sitting there waiting for her Auntie to ride in on a white horse to save her from her bland palate. If her aunt would just let her discover things on her own, she might grow to like them. But just based on reading this article, I hope the girl plays the super-picky card anytime she’s at her aunt’s house for dinner. Hell, if I was the author’s sister, I’d be encouraging my kid to play it up just to bother Auntie Know-it-all. It’d serve her right. Well, I much as I bemoaned my aging upon the receipt of the magazine, of course I actually read the whole thing. Some of the articles seemed silly and had nothing to do with me, but there were some nice recipes and some articles that were actually applicable. Anyway, today I got my second issue of Good Housekeeping in the mail, and I decided to open it while I was waiting for my husband to finish preparing dinner. I feel like that’s probably against some sort of GH subscribers’ code or something, but that’s my version of Excellent Housekeeping, so they’ll have to cope. In the “letters to the editor,” there was a letter regarding an interview with Michael J Fox that appeared in the July issue. The letter was from a subscriber who has MS and said that the interview was inspirational for her. Well, I’d be lying if I told you that I haven’t been having a tough time with this whole illness thing lately, as I approach my six month MSaversary, so I decided to seek out the article to see what had comforted this woman. Luckily, the whole interview is available online, so I was able to read it. In the article, Fox talks about an acting technique that I reference with my students: “Don’t play the result” (or “Don’t anticipate the result” or “Don’t play the ending,” depending on which book or acting teacher you first heard it from). Fox says that when you have a chronic illness, it’s kind of like standing in the middle of the street and knowing you’ll be hit by a bus. You know it’s going to happen, but a good actor doesn’t behave as though it’s already happened. A good actor only behaves as though it has happened after it already has. He also references the “if,” a technique which requires actors to imagine “what if” and “act as if” a certain situation was, in fact, reality. Stanislavski, who came up with the technique, wanted actors to use it to put themselves in the positions of characters unlike themselves. Fox believes that in life we can act as if life is the way we want it to be, and it may in fact become what we imagine it to be. I really need to endeavor to remember these things when I start feeling sorry for myself. There’s at least one time a week that I’m running and think to myself “I wonder how much longer I’ll be able to do this.” I need to work on not playing the result. Yes, at some point the worst of the symptoms may take me over and I may be stuck in a wheelchair or with a walker or cane. But what good does it do me to focus on that now? If I was an actor in one of my shows, I’d tell that actor that the audience shouldn’t be able to tell what’s going to happen based on her behavior now. I’m going to try to use the magic if every day. “What if I wasn’t afraid? How would I behave?” I will imagine that I am a woman who is unafraid of the future because she’s not playing the result.